This is a high quality embroidered patch and is approximately 14 inches from wing tip to wing tip. This is a high quality embroidered Aviation Ordnance Logo Patch. It’s 4-inches from wing tip to wing tip and is a great item to put on military or civilian clothes to show the AO Pride. IYAOYAS ? Ordiemart! 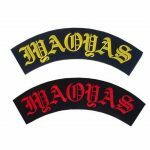 This is a high quality motorcycle jacket patch that is 11-3/4 inches wide and 14-3/8 inches tall. What a great way to show that you’re an Ordie!!!! Skull Sticker is 6-3/4 inches wide X 8 inches high. This is a high quality, die cut, laminated vinal sticker that will give you years of wear even in the hot climates. This really looks great on the back window of your vehicle with one of our AO Logo stickers.